In a world driven by the need for the newest technology, it’s comforting to meet a young man who finds his contentment in cardboard. Carlos Hernandez Diaz, a Guadalajara native and owner of Ajijic restaurant Rustica, earned a degree in industrial design at the Universidad Autonoma de Guadalajara (UAG). Then he discovered that his education didn’t lead to a career in that field. Instead, he found his niche as a restaurateur which leaves him time to sculpt mammoth works made entirely of cardboard and brown kraft paper. Gazing at his current project, a finely crafted 15-foot-tall dinosaur standing guard over the entrance of Rustica, I bombarded the 27-year-old artist-entrepreneur with questions about his hobby and business. Hernández opened Rustica about two years ago, once he’d found a pair of women to staff the kitchen and create the pastries for which the restaurant is known and to keep up with cooking the simple breakfast and lunch menu choices. “There are a lot of restaurants here in Ajijic, so I knew that it was to succeed, I had to do something different from the rest and that had to be something I could do well. We started by making our bread for the lunchtime sandwiches and then expanded into rolls for breakfast. Now we do a line of traditional-looking Mexican pastries. Most of those made in other places are pretty, but don’t have much flavor or substance. Here we’re changing all that.” Hernandez smiled and added, “It seems to be working. So far our breads and the cinnamon rolls are the favorites of my customers. There’s no question that Hernandez’s projects help draw those customers in the first time. For months a lovely towering castle was the centerpiece of the restaurant and visible from the street, drawing in the curious and sightseers who became even more intrigued when they realized that the immense work of art was handmade, without a kit, and entirely from cardboard and paper. 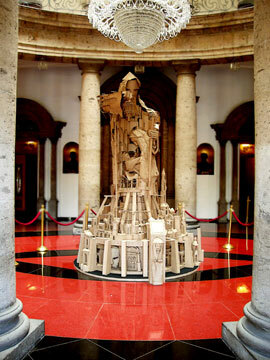 About the same time Hernandez created an immense nativity scene for display in the rotunda of the Teatro Degollado. This piece was a six-meter-tall Joseph who held a lantern to cast a glow on the kneeling Mary and the infant she holds. Surrounding the holy family on the four-meter diameter structure he built a Biblical village – a representation of Bethlehem in the round. Even Hernandez couldn’t remember all of the pieces he made during that time, none of which still exist. That summer he created a model of a city for Guadalajara’s children’s museum. The downtown area skyline was studded with skyscrapers and other iconic features and details of any city. 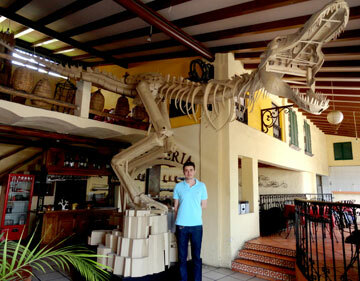 As I tried to shoot photos of the massive and still unfinished cardboard dinosaur that stands guard over the entrance of Rustica, Hernández explained that this was the project he’s been thinking of making for years. Pressed to reveal the amount of time and materials needed for projects like this, Hernández floundered and then said, “I work on it every day. I don’t notice the time, really. I just like to build stuff. In fact, I have to have a project. I really need to keep doing something with my hands and being creative. To view photos of some of the other major works by Hernández, visit http://universo-mech.blogspot.mx.